I would venture to guess that when city officials talk about TIF’s the general public doesn’t have a clue what “TIF” means. TIF is an acronym for Tax Increment Financing. Tax Increment Financing is used as an incentive tool for development or redevelopment in areas of the city that have been difficult to development for whatever reason. Listen to the February 2012 Inside Town Hall program and you will hear former Economic Development Manager Erica Beck and Councilor Michelle Erpenbach talk about TIF’s. The first TIF District approved by the city council was in 1989 and encompassed the entire downtown area. Historically, the city has used tax increment financing for the core of the community. The downtown area which was also defined The Urban Renewal Area was the first TIF because it was an area that had, for years, been the most difficult to re-develop. The process for approving a TIF district requires the plan to first go through the Planning Commission. If the Planning Commission approves the TIF District boundary and plan it will then go to the City Council for adoption. The City Council approves the boundary of the TIF District and approves the project plan which defines eligible items (public improvements and associated expenses) and the projection on how long each district will last. TIF’s can last up to a maximum of 20 years. Typically, past TIF Districts have lasted 10-12 years. Just because a TIF District is created doesn't mean the plan will be implemented. 3 TIF District plans, #4 , #6 , and #9, created in 2005, 2006 and 2008 respectively were never brought to fruition. Property taxes are collected and disbursed to the county, the school district and the city. In a TIF District, the developer pays all property taxes every year and the portion attributable to the development that increased in value prior to the project is set aside in a special fund at the city. This fund may reimburse the developer for specific costs they have incurred in the project as per the plan. It is a reimbursement program where the developer incurs the cost and pays the bill prior to TIF reimbursement. There have been a total of 15 Districts approved for tax increment financing, 8 of which are currently active. If you visit the city’s website, the Community Development/Economic Development page you will only see 4 active TIF districts listed when there are actually 8 active TIF Districts. One of those four listed on the city's website has been terminated although it still shows up as active on the website. Where are the other 5 districts and why aren’t they on the website? TIF’s are popular because it is a tool for local government to finance public investment in new private investment. It uses increased property taxes that a new development generates to finance certain public costs of the development. It also affords all taxing entities (city, county, school district) to maintain their current tax revenue during the life of the TIF. At a recent Good Morning Sioux Falls program sponsored by the Chamber of Commerce, City Director Darrin Smith stated that in the past 18 months the city has approved six new Tax Increment Finance Districts which compared to 9 TIF’s approved between 1989 and 2009. He stated that although the city will continue to be selective on the TIF’s approved, the city wants to be aggressive in promoting economic development. Establishing TIF districts is serious financial business. This financing tool should be used cautiously and conservatively with very specific criteria in place to justify the establishment of a TIF District. The danger with emphasizing quantity is all developers will want a TIF created, i.e. hotels, strip malls, cafes, bars and other commercial activity. The way Director Smith sounds, it’s a competition to see which administration can create the most TIF’s. As I heard on late night TV one night, it's not the size of the boat but how it rides the waves that is important. In the case of TIF Districts, it's not quantity but whether the investment added dollars to the community that's important. It's not the number of TIF Districts you create that is important, it's the total value added in the development that's important. That is what the economic development czar should be talking about, not how many TIF Districts he has created lately. I am hearing the city council will be holding a city council working session next Wednesday, April 25th at either 3 p.m. or 3:30 p.m. There is no posting of this work session on the city's website to date. Although the requirement to post a public meeting is 24 hours in advance, it would be nice to get a notice of this working session earlier than 24 hours before the actual meeting. One of the agenda items is supposedly a discussion on the railroad relocation project. It seems a BNSF spokesperson might be at this working session. If you live in the southeastern or central district of Sioux Falls, you might want to go to this working session. You will have to physically attend the session since working sessions are not televised nor are official minutes recorded by the city clerk. It is also my understanding that the city council does not take any public testimony at this working sessions. Below is specific city ordinance language pertaining to working sessions of the city council and when minutes are taken. It would appear that the city clerk's office prepares minutes of every meeting except the working sessions of the city council. Why is that? If there is a quorum present, it would seem this would dictate an official meeting, irrespective of the fact that no votes are taken. But clearly, the ordinance does not include city council working sessions as a meeting where minutes are required to be prepared by the city clerk. So, if you want to know what the city council is discussing, especially as it pertains to the railroad relocation project, you might just want to attend the next scheduled working session of the city council - maybe next week. Why would the council hold a working session to discuss such a controversial project where no public input will be allowed and no minutes will be published. Shouldn't discussions regarding the railroad relocation project be an agenda item on an Information Meeting where the discussion is televised and minutes are taken so the public has an opportunity to see and/or review the discussion? Any discussion regarding the railroad relocation project would seem to go far beyond "discussing matters pertaining to the affairs of the city council." This project affects the general public, specifically the southeast and central districts of the city, not the affairs of the city council. Is this transparency in city government? Sec. 2-5. Informational meetings and working sessions of the city council. (a) The city council may meet in informational meetings and working sessions which shall be open to the general public to review and discuss matters pertaining to the affairs of the city council provided that all discussions and conclusions thereon shall be informal. All agendas for informational meetings and working sessions of the city council shall be posted with at least 24 hours notice. (b) Informational meetings may be held the first three Mondays of the month and on the last Monday of the month. When the day fixed for an informational meeting falls on a date designated by law as a legal or national holiday, such meeting shall be held at the same hour on the next succeeding day not a holiday. Cancellations must be posted with at least 24 hours notice to the public. (c) Working sessions of the council may be held as needed. (d) The city council chair and vice chair shall determine the agenda, with city council input, for all informational meetings and working sessions. (4) Record of any votes taken. (b) Approval of minutes of all city council meetings and informational meetings shall be considered at the next regular council meeting. Such minutes may be reviewed by the city clerk, or the city clerk's designee, to correct spelling, numbering, or other such technical defects. Above is the information flyer distributed to certain residents in southeast Sioux Falls. What's next, says Alfred Benesch & Company? The city will work one on one with individual property owners to identify impacts and determine the best course of action for addressing issues such as safety, noise and aesthetics. The city will collect comments from the meeting and consider them in the EA and in the design process. A public meeting is planned for September. Once the EA is approved, final design will begin, followed by right-of-way acquisition, and then construction. Why isn't this flyer on the city's website since it came from the city's consultant working on the railroad relocation project so everyone can see it? 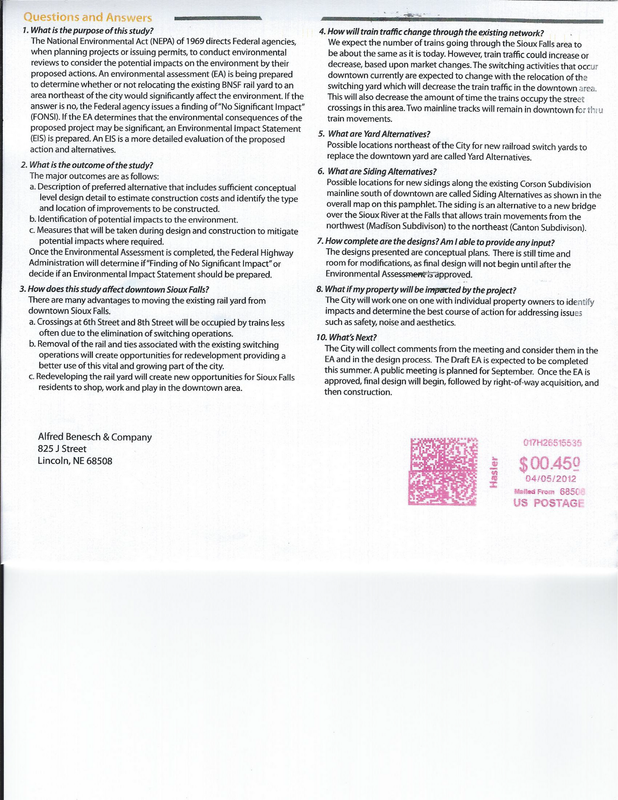 Last month, people who live in that little corner of heaven that could be disrupted by the train movement of a proposed railroad relocation siding option got a flyer from Alfred Benesch & Company located in Lincoln, Nebraska. The company is the city's consultant on the railroad relocation project. Although I live less than a half a mile from the 57th Street Bridge, I did not get a flyer. You have to live really close to the options to get personal mailings about this project. That's stipulated in an ordinance. But I digress. The question was asked of me, why are we getting this material? It would seem the city is still moving forward with the siding options for southeast Sioux Falls. My response was the city is obligated to provide public information regarding the project and no decision has been yet. Hence, the flyer. The people in the Southeast District are still uneasy and wondering what the City Council is going to do about the options affecting the tranquility of their residential area and their property values. What is in dispute is the amount of train traffic that will be generated by the two siding options in the residential area identified by the city and its consultants. Although city officials said last month that there would only be one additional train per week, BNSF officials say that number is incorrect. An April 12th ARGUS LEADER article quoted BNSF spokeswoman Amy McBeth saying she doesn't know how many trains, but that it was "certainly more than one train a week, and that traffic will grow." The article goes on to state the growth in the state agriculture sector is a major reason for more trains. When will the mayor and council inform all the people affected by the rail relocation? The mayor and city engineers told residents that only one train per week would need to use a proposed south-side railroad sidling. Sources within BNSF are now estimating that 27 trains per week will need to use the south-side turnaround if the rail yard is relocated. Think that you are going to get an overpass at your most-used crossing? Not a chance; overpasses are at the least $6 million a piece, and none are planned within the current proposal. Have you experienced the traffic at 26th and Southeastern when a train passes through? Now you will have that joy up to 54 more times a week. When will the mayor be honest and tell all the folks what this small piece of land will really cost in the end to the east-side residents? You better love watching the trains go by and hearing the whistle, folks, because we are going to get a lot more of it. Brian Akers also wrote a letter to the mayor and city councilors regarding this issue, speaking specifically about the new elevator going up near Lyons, SD and the impact that elevator will have on train activity to Sioux Falls. Here is the link to the article published in the November 2011 issue of Tristate Neighbor. Isn't it interesting that increased train traffic to Sioux Falls was being talked about back last year yet city officials were still talking about the minimal increase in train traffic at the public meetings. There are two options being considered: the area between the 57th and 69th Street bridges and the area further south between 69th and 85th Streets. Neither option is palatable because of the increased train traffic through central and southern Sioux Falls. Southeast District Councilor Sue Aguilar stated in the April 12th ARGUS LEADER article: "What you're doing is doubling the train traffic through the Southeast and Central Districts," Aguilar said. "I don't feel that is an acceptable plan." Besides Councilor Aguilar, Councilors Anderson, Jamison and Erpenbach all say that the option to build a siding in southeastern Sioux Falls is a non-starter. Add to those 4 councilors, councilor-elect Staggers who has also stated non support for that option. In addition, when asked about the council approving additional money for the project over and above the $36 million federal earmark, Staggers has said he would oppose using even "one dime" of city taxpayer money on the project. Chug-A-Lug, Clickety Clack. 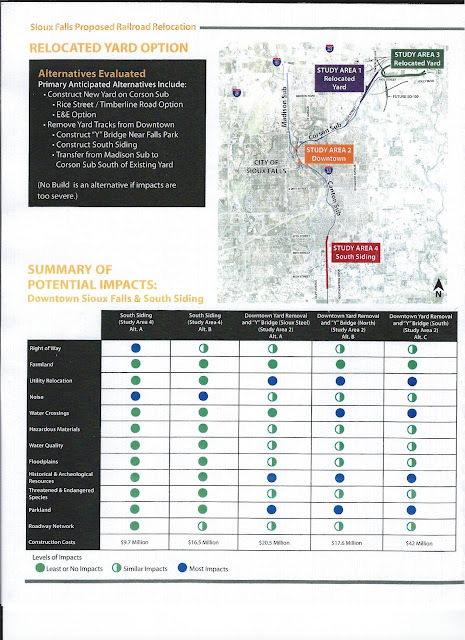 The siding options proposed by the city are not good for the southeast and central districts of Sioux Falls and thank goodness there are city councilors who think these options are a non-starter for this project. These Councilors must stand their ground on this issue and vote a resounding NO if this option comes before them. If you live in southeastern Sioux Falls, you know that right now you are in the midst of two hotbed issues. One is the proposed building of a new Walmart at the corner of 69th and Cliff Avenue. The other is the proposed railroad switching alternative related to the Railroad Relocation Project. Both issues have propelled citizens in this quiet district of the city to civic action. The future land use regarding this agricultural property was first identified as multi-family and the land use was later changed to commercial and office development. The owner of the agricultural property petitioned that the land be changed from agricultural to C-4 which was approved some time ago. Hyvee had plans to build a grocery store on this site and requested that the property be rezoned from office to commerical. Drainage problems were identified and drainage plans were necessary for the project. At issue before the Planning Commission on April 4th was the rezoning of property on the NE corner of 69th and Cliff Avenue. The total site is 17.2 acres of which 13.9 acres is already zoned C-4. The request before the Planning Commission was to rezone the northwest corner from office to C-4 and to rezone the remaining 2.65 acres from office to recreation/conservation. The action by the Planning Commission on April 4th did not approve the project. This body only makes a recommendation regarding the zoning of the property to the City Council who has final approval on the project. If the City Council approves the rezoning, it will take effect about 25 days later. If the approval takes place, then the property owners within 250 feet of the property requested for rezoning can petition to protest the rezoning. If 40% of the eligible property owners sign and file a petition within 20 days after publication of the City Council's approval of the rezoning, the City Council must review the granting of the rezoning at its next regular scheduled meeting. If the protest is filed the ordinance does not become effective unless it is approved by a resolution by six (6) members of the City Council (source: Sioux Falls official website, Planning Department Section). I have heard people ask, regarding both issues facing citizens in the southeast district, why only the citizens immediately surrounding the proposed area are given official notice by the city. Well, public notice to citizens is set out in city ordinance. In the case of rezoning, city ordinance only requires that city planning staff send written notification to property owners within 300 feet of the subject property prior to a hearing. If you are not within 300 feet of a disputed land use issue, you might not even know it is going to happen until it is done. The Walmart issue is a difficult one because part of the proposed site is already zoned C-4 which means Planned Commercial District designation for personal services, office and retail. I do not buy the sentiment that the opposition is about "not a Walmart in my backyard." If that were the case, this would be a no-brainer decision for the City Council. The issue is whether a big box store "fits" in this corner. Take a look at where big box stores usually locate. They locate in areas that are specifically designed to promote additional significant retail activity. They locate in big commercial zoned sites that support extensive retail and commercial activity and traffic. This corner is not a shopping center nor is it a strip mall location. Walmarts, Target stores, Kohls - all those big box stores locate in big commercial zoned areas that promote big retail activity. 41st Street and Louise Avenue corridor, 10th Street and Highway 11 which is home to the new Dawley Farms Retail area - that's where you see these big box stores locate. They don't locate on the corner of some residential area that is zoned for light commercial and office trade. The corner of 69th Street and Cliff Avenue is not a big commercial strip mall environment. Take a moment and drive to that corner and you will see that it is no where near the kind of retail strip mall environment that 41st and Louise is or the area of Dawley Farms. Just because you can build it there, doesn't mean you should build there. The general location and character of this property is not conducive to a big box store irrespective of it's C-4 zoning. Does approving the Walmart store represent a logical and orderly development pattern for this area? I submit to the City Council that it does not and it should not be approved. I have been hearing a rumor that City Councilor Sue Aguilar, representative from the Southeast District, was delivering election ballots and picking up ballots from polling places during Tuesday's school board/city council and charter revision election. I don't normally buy into rumors because they are just that, rumors. However, I have heard this on numerous occasions since Tuesday's election and today it comes from a good enough source that it bears outing. It is clear that there were problems with the election Tuesday when polling places ran out of ballots and ballots needed to be transported from other locations. A sitting city council member has no business being involved in the election process, whatsoever. It is highly irregular and begs the question why these ballots were outside an election officer's official custody. Who was actually in charge of this election process? We know that there were three fingers in the recent election pie - Auditor Bob Litz, City Clerk Lorie Hogstad and School District representative Bev Chase. In past elections, these official election officers hire election workers to do specific tasks. It will be interesting to see what the legal ramifications are, who will investigate this matter and what effect this may have on the election. ARGUS LEADER, show us your investigative prowess and get on this story. I know for a fact, you know about this as well. My non-city employee source says City Hall is already talking about it. Once again, the city council elections tell us that incumbency is a valuable experience and surely a guarantee to re-election. We not only see it in local elections but we see it time and again in state legislative sessions where candidates recycle themselves back and forth between the State Senate and the House seats. Personally, I am glad Jamison won his re-election bid. He has stepped forward and asked the hard questions while being belittled and demeaned by the mayor and it never deterred him from taking a contrary position knowing he was going to take a beating from a bully. Karsky's first election win is no surprise because he has the aura of "incumbency" surrounding him and he faced an opponent that never seems to catch on, no matter how many times he runs. Anderson's win is no surprise either. A nice guy who usually has not made a significant mark one way or another. However, it was nice to see a little feistiness in him during the Owens debacle. I hope he has finally found his independent voice and we see more of this behavior in his second term. The at-large race, in my opinion, is what got what little turnout to actually turn out. The general consensus was if it was a low turnout, Staggers would be victorious and if it was a large turnout, Knudson would be the victor. I would venture to guess the 11% voter turnout for Buttemeier was related to a protest vote and not necessarily showing support for his candidacy. To say Kermit Staggers is a conservative is an understatement. He is like the energizer bunny - he never quits nor does he ever go away. Some people like him because they say he scrutinizes city spending priorities and always says no. Well that is all well and good, but if he can't gain consensus among his fellow councilors, he will be as ineffective as he was during his previous 8 years on the city council. He accomplished nothing with his contrarian ways during his previous stint as a city councilor. His return to the city council is more reflective of a mood these days regarding the mayor, in my opinion. Staggers stated he thinks the event center played a role in his victory but I think it goes beyond just the event center. I heard many times from people in the community that they were going to vote for Staggers because it would be good folly to see him be a cantankerous sore in the mayor's side. Regardless of how you feel about the outcome of the council race, one thing is certain. It will be interesting fodder for commentary. City Council meetings on the city's Channel 16 might get some new viewers. Most municipalities don't have the luxury of trying to decide how to spend surplus dollars in their capital improvement plans. Based on what the city's lead auditor said in an April 2, 2012 Fiscal Committee Meeting, the city has enjoyed a $2 to $4 million dollar annual surplus in the capital improvement program each year except 2009. The directors submitted their recommendations on how to spend the $4 million surplus in the CIP to the mayor.The mayor elected not to accept director recommendations on their CIP recommendations and instead submitted an ordinance to redirect the $4 million of unobligated CIP funds remaining from 2011 to the Event Center construction debt. When asked by Councilor Jamison at a Fiscal Committee Meeting if the council could be given the director's recommendations, he was told by Finance Director Turbak that the mayor decided to pay down the debt so essentially the answer was no. The Council was not going to get to know what the directors submitted as recommendations on how to address their infrastructure needs using the $4 million surplus in the 2011 CIP. No wonder 6 of the 8 councilors voted no on the mayor's proposed ordinance to use the $4 million in unobligated CIP funds from 2011 projects to go towards the Event Center construction debt at the City Council meeting on Tuesday, April 9th. Voting no were Councilors Brown, Jamison, Anderson, Erpenbach, Aquilar, and Karsky. Voting yes to the mayor's plan was Entenmen and Rolfing. In presenting the Mayor's plan to direct the CIP surplus as a cash down payment that would reduce the amount of debt for the project by $4 million, Finance Director Turbak stated: "The plan that was presented to the voters was the best plan that we could get, the best plan we could develop at the time. It wasn't a perfect plan. That was acknowledged on a number of occasions, perfection of course is rarely achieved. If we would've waited for the perfect plan to come along, we wouldn't move forward on many projects ever but in spite of the fact that it was not a perfect plan, the voters did approve the project and authorized us to move ahead." Excuse me????? That is the justification of the administration to now apply the CIP cash surplus towards a debt that has already been planned for and presented to the public as debt we as citizens could afford but it really wasn't a perfect plan? If that is not doublespeak, I don't know what is. If the city was so worried about the amount of debt, they sure didn't indicate that to the general public when they were selling their plan to finance the Event Center through tax exempt and taxable bond debt. To acknowledge that the public and some of the council members complained that there was no cash down payment as a justification to now use the surplus CIP money to buy down some of that debt is most interesting. Why buy down debt that is already planned for and is moving forward? The city presented a plan to finance the construction of the Event Center through the sale of bonds. $102 million in tax exempt bonds have already been sold at a very attractive interest rate. The remaining amount will need to be sold as taxable bonds although no sale has been scheduled because the naming rights are being negotiated and the finance director says he needs to know about the $4 million dollars first. Isn't it interesting how the plan keeps changing from what was presented to the general public during the campaign to get the public to vote yes on the EC election. Obviously, 6 of the eight city council members don't buy the mayor's plan to use the surplus unobligated CIP money for this "new" plan, especially when the mayor already presented his plan to the public on how the event center construction was to be financed - through debt obligation of bond sales. It was a good idea then, but not a good idea now? The Council's Fiscal Committee is going down the right path when they state there needs to be a policy regarding remaining unobligated CIP funds in a calendar year so they do not have to revisit the issue each year. The directors know what needs to be addressed in terms of infrastructure needs, whether that is unexpected, unplanned capital needs or projects that were delayed or moved out due to other priorities. The bottom line is that there are plenty of CIP needs and/or priorities that the surplus money can be used redirected towards this year. The city already has a plan of action for the Event Center construction costs. They sold that plan to the public and the public approved the plan to finance the Event Center construction cost of $115 million by selling bonds and incurring the a debt for the next 22 years. At some point, we need to move on and deal with the other infrastructure needs that still exist outside this big Event Center. Streets, water, sewer, parks, libraries, fire stations, traffic lights, building maintenance needs - the infrastructure needs are endless. The mayor sold a plan to finance the event center construction. The public bought his plan, hook, line and sinker. Now, we hear it was not the perfect plan and we should be worrying about all that debt over the next 22 years and should use surplus CIP money to save us from all that debt. If the administration was so worried about finding additional money to fund infrastructure needs maybe they shouldn't have worked so hard to sell the debt idea to the general public as a no worry plan because we can afford it. Use the surplus money to take care of infrastructure needs as identified by the directors. Thank you to the six councilors who voted no to the mayor's plan to redirect the CIP surplus funds to his event center and who clearly see the need to address the city's other infrastructure needs. The buzz word right now regarding the Railroad Relocation Project is the Environmental Assessment phase of the project. Hydraulic analysis to determine impacts to the Flood Plain and a mitigation procedure for the impacts. Complete noise analysis to determine existing noise levels, prediction of post development noise levels, analysis of traffic noise abatement measures, and preparation of a noise analysis report. The noise analysis part of the EA caught my interest. The tendency is to think about traffic, but what about those noise levels? The EPA has established noise emission standards for surface carriers engaged in interstate commerce by railroads. It will be very interesting to read the complete noise analysis report regarding the Canton siding option. These standards and rules were promulgated through the Noise Control Act. Congress declared in Section 2 of that Act that "it is the policy of the United States to promote an environment for all Americans free from noise that jeopardizes their health and welfare." None of those locations paint a very pretty picture in terms of an environmental assessment. The parking of train cars with hazardous materials in residential areas should raise an environmental concern. Trains moving through Sioux Falls neighborhoods that contain hazardous materials raise environmental concerns. The vast majority of motor freight and railroad transportation facilities are considered hazardous waste generators. Is BSNF considered a hazardous waste generator under the EPA regulations? The possibility of train derailment along any of these routes could create a serious environmental emergency in residential areas surrounding this rail line throughout Sioux Falls considering the increased rail activity to switch engines. The social and economic impacts to these areas are serious. Property tax values would be impacted; noise levels would be impacted; the serenity now enjoyed in various residential settings in two of the options would forever be changed because of this railroad switching hub of activity. Major traffic problems when a the heavily traveled north/south route on Cliff Avenue is blocked due to the increased rail activity with the "Near Downtown Alternative." Pushing traffic into surrounding residential areas is no real solution either. Major traffic problems with multiple at-grade crossings in the SE option. Traffic issues abound. The bottom line is no federal funds can be accessed by the city through the SDDOT without the completion of an environmental assessment. This is a complicated process, no doubt about it. It seems pretty obvious that the Environmental Assessment phase is the roadblock to this project as evidenced by the lack of progress since 2006. If this project is a no go because of insurmountable problems related to the Environmental Assessment, just tell the public and move on. If you haven't heard about the Railroad Relocation Project Internal Audit conducted by the City Council's Internal Audit team, then here is a link to the report. The report was completed in March, 2012 by the city's Lead Internal Auditor. In 2000, the city hired a consultant to perform a feasibility study related to the completion of the Phillips to the Falls project. The consultant was paid $127,310 in 2001-2002. The same consultant was hired again in 2003 to perform work on the railroad relocation project. The consulting firm was paid $127,737 in the years 2003-2004 for design work on Phase 1 of the project related to an underpass at Pasley Park and adding siding tracks at Benson Road. The funds to pay for the consultant services above came out of the second penny sales tax fund. In 2006, the city received a congressional earmark of $40 million dollars for the relocation project. A railroad relocation fund was established to track project expenditures. This is how it works: Congress appropriates the funds; the Federal Highway Administration (FHWA) awards the funds; the South Dakota Department of Transportation (SDDOT) oversees the funds and verifies compliance with federal regulations; the City of Sioux Falls is the user of the funds. An environmental assessment must be completed in order to use the federal funds. Herein lies the problem about accesssing the federal funds. From 2006 through 2008 the city paid $592,023 out of the railroad relocation project fund for property appraisal fees, legal services, and title searches. The Environmental Assessment essentially stopped in 2008. 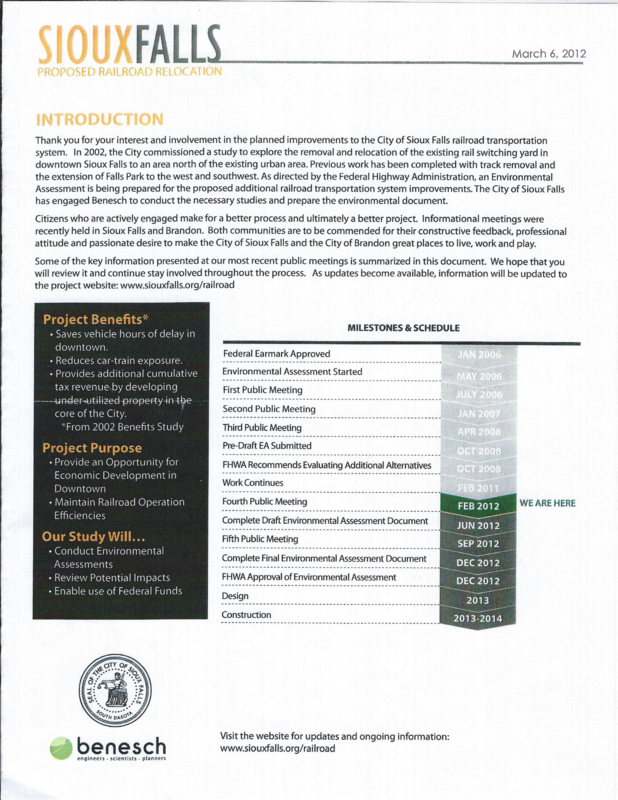 A Financial Review of the Railroad Relocation Project was conducted by the SDDOT Audits office in 2009. Eight audit issues were outlined in the report along with corrective actions. See page 4 of the report. In 2009, the fund was in the red by $200,000 due to questions by the SDDOT regarding which expenses were eligible for reimbursement for the project. On February 11, 2011, the SDDOT reimbursed the city $124,000, leaving a deficit of $74,994 in the railroad relocation fund to date. The City Finance office is showing $36,538,098 in anticipated federal revenue in the railroad relocation fund. The city administration said the environmental study would be completed in June 2011 and the draft environmental assessment would be completed in October 2011. Those dates have come and gone and neither has happened yet. A comprehensive management plan by SDDOT, the city, FHWA and the consultant was to be completed by March 2011. Is it done yet? A deficit in the Railroad Relocation Project Fund. No draft environmental assessment report to date. The City can't access those federal funds until the ES is completed. Public outcry regarding the Canton siding alternative option. Public outcry regrading the main switching line near Brandon. BSNF says it won't contribute any money to the project saying it is a "city project." There must be a reason why this project has not moved forward. No cooperation from the railroad who doesn't see this as their project. Land use issues relating to the relocation of those rail lines haven't been resolved since the beginning of the project back in 2006. Is this a project that is meeting it's demise because there were no palatable options back then and there still aren't any now? How Many Trains Could Pass Through Southeast Sioux Falls? Several weeks ago, during two public meetings on the project, the city indicated it would mean only one additional train per week. But BNSF officials in Minneapolis said there would be more traffic than that. “They didn’t give us a number, but they made it clear there was more than that, and we could see more train traffic in that area,” said Council Chairwoman Sue Aguilar, one of the 10 who went on the trip. The rumor mill is that there could be more than 25 trains per week that would travel through southeast Sioux Falls back and forth between downtown and the Canton siding alternative out there in all that residential development. Can you imagine an additional 25 trains or more moving through all those grade crossings in east and southeast Sioux Falls? Can you imagine the traffic problems?Why would the city indicate one additional train per week to people at the public meeting when they really didn't have any idea how many trains could be passing through Sioux Falls on its way out of downtown and on the way back into downtown? How many of those trains are going to be parked along that second alternative siding out there in southeast Sioux Falls. All those people who are up in arms about Walmart building one of their superstores in a residential environment at 69th and Southeastern should be just as upset about this railroad relocation option. Trains and more trains meandering through southeast Sioux Falls need bridge overpasses at Marson Drive, 49th and Southeastern, 26th and Southeastern, River Boulevard and Southeastern and Cliff and 12th Street, like the ones at 69th Street and 57th Street. Where would the city get money for that kind of infrastructure? The traffic problems, noise problems and the enviromental impact to residential property values in southeast Sioux Falls will be severely impacted by this railroad relocation option. Tell us Mr. Mayor and City Council - how many trains does BNSF say could be traveling through all those residential areas of east and southeast Sioux Falls if you approve the Canton siding alternative in the railroad relocation project. Oh, wait the mayor said this in the ARGUS Leader yesterday: Huether declined to say what options BNSF liked and what options it didn’t for removing the yard and rerouting trains through Sioux Falls. 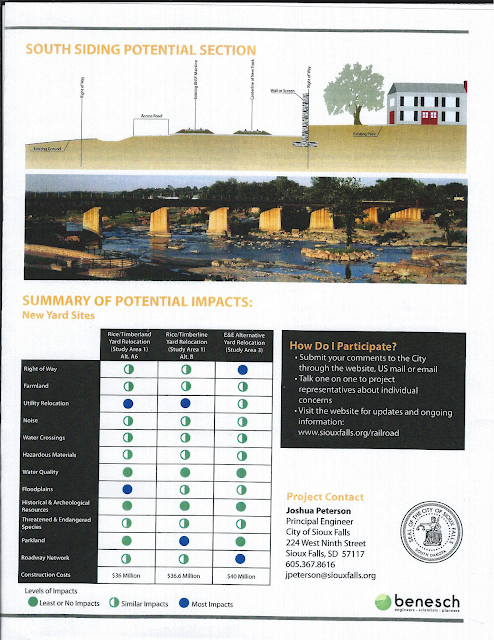 Several options, including the new bridge at Falls Park, are part of an ongoing federal environmental assessment study. “Sincerely, until that environmental assessment is complete, it’s not appropriate for me to comment one way or another on any of the options,” he said. I would like to hear more about this meeting with BNSF. What exactly did they say? What options did they like and dislike and why? Why doesn't the public have a right to know? Why is everything such a big secret? No information means rumors abound. Two weeks ago I was on my way to the hospital to visit my new granddaughter, I came up to the intersection of 26th Street and Southeastern Ave. I saw the long train of liquid tank cars parked on the tracks that parallel Southeastern Ave. It is a common sight to see long lines of rail cars parked on the tracks between Marson Ave. and 26th Street. Just as I turned left onto 26th Street the railroad crossing lights came on. I told my grandson that we were in for a bit of wait. We counted 113 cars as they passed over the crossing at 26th Street. The wait was over 10 minutes. This train crossing would go on to block the street crossing at Southeastern and River Boulevard and on Cliff near Drake Springs Pool as it travelled to downtown Sioux Falls. It was 3:27 p.m. on a Saturday afternoon. When the train finally cleared the 26th Street crossing, traffic to the west was backed up past Yeager. Traffic on the I-229 26th Street exit was backed up to I-229. Who knows how far traffic was backed up east of the 26th Street intersection at Southeastern Ave or the other directions. It was a Saturday afternoon, not a week day. A light traffic day. Tell me what happens to the response times of an ambulance, fire truck or police car stuck in one of these east side traffic jams because of the train traffic? The point is traffic in the east side corridor of Sioux Falls has a big time back-up when those 100 plus trains crawl through this corridor on their way into downtown Sioux Falls or on their way out of downtown Sioux Falls. Just imagine the traffic build up when this occurs around 7:30-8 a.m. during the week or in the afternoon hours of a work week. Just imagine the additional train traffic that will occur with the reality of the Canton siding alternative. Then imagine what it will be like if the City Council approves the Canton Siding Alternative and you live or work in the east side corridor and need to travel over the crossings at 49th and Southeastern Ave, 26th and Southeastern, River Boulevard and Southeastern and Cliff Ave/near Drake Springs Pool crossing. Long trains and long waits are in your future. Today, the ARGUS LEADER reports the only remaining option to move trains through town would be a second line paralleling the existing line in southeastern Sioux Falls. The second line would allow a train to switch its engine from one end to the other and then allow the train to travel back through the city. Just great. They will travel through all those street grade crossings in east Sioux Falls, to switch the engine from one end to the other and then travel all the way back the way they came in the first place. Does that make sense? The Canton Siding Alternative sacrifices the quality of life of southeast and east Sioux Falls. The Canton Siding Alternative sacrifices the residential housing development between 57th and 69th Street. The Canton Siding Alternative sacrifices traffic flow of east and southeast Sioux Falls. The $36 million earmark is not enough to pay for this project. There are too many street grade crossings that will inhibit traffic flow patterns. There will be increased train traffic though southeastern Sioux Falls by creating a new siding alternative in a completely residential environment. There is fierce opposition from residents in Southeastern Sioux Falls to the Canton siding alternative. BNSF has declined to contribute any money to this project. They are happy where they are at right now. This stance does not mean I am no longer a supporter of Downtown. What it does mean is the city needs to do a better job of coming up with alternative options for this project than to take the easy way out and sacrifice the residential area in southeast Sioux Falls. They haven't done that yet. Nor have they talked about a plan to deal with the multiple grade crossings, the traffic gridlock and what increased train traffic will do to cut off access due to the Canton siding alterntive option. The city needs to go back to the drawing board. In six years, the southeast option was never brought up as an option until this past year. Meanwhile, the city allowed new residential development to spring up along this corridor.